Highend is one of the popular WordPress theme from HB-themes offered through Mojo marketplace. The theme cost $49 for a single site license having most of the needed features. After using the theme for a while on our sites we wanted to share our experience for those who are looking for a genuine review of this theme. Pricing – Is it Worth? From the cost perspective it is definitely worth of buying all of these plugins and a beautiful theme together. Get Highend WordPress Theme Now!!! Once purchased, you can download the theme from Mojo marketplace along with demo and child theme files. Like any other third party themes, you can install the theme through WordPress admin dashboard or upload using FTP. Once installed you will be prompted to install the required plugins as listed above. It is highly recommended to install the plugins only if you needed them. For example, both Slider Revolution and Layer Slider plugins offer similar functionalities. Hence install one of them to create featured header sliders for your site. The demo files can either be imported through FTP or installed directly from the WordPress admin dashboard. The theme offers a system diagnostics feature to check whether your hosting can allow importing the theme or any modification is required on settings. We noticed, the installation of theme works fine but the demo import always timeout with PHP time limit. In most cases, you only need the theme files to be installed on live site and demo data is not required since it will add hundreds of demo pages which you need to delete again. There are bugs on the theme and compatibility issues specific to individual sites. At the time of writing this review, there are more than 10K 15K issues recorded on their support forum. In general support team responded well for theme specific queries. But on a general queries like “why theme does not recognize recommended schema?” was never answered. What we understand is the bugs are coming out of bundled plugin updates and compatibility issues with other plugins like Woocommerce. Since the theme is updated frequently to align with plugin’s update you should never update the theme directly on a live site. Trying out on local or staging site before updating live site is a mandatory requirement with highend theme. Once the initial site is setup as per your need, there may not be much need for contacting support frequently as long as you don’t change the setup again. They also have plenty of documentation and video tutorials for learning and referring. Ensure to disable auto updating of theme in live environment to avoid issues with the updates. Whether you are new to WordPress or already familiar with default WordPress editor using highend theme needs some time to get acquainted with the plugins. Building page with visual composer needs you to understand “what is what” and the huge set of screen options may confuse you initially. We also noticed the visual composer is very slow on shared hosting dashboard causing delay in post editing. In short – it will not be as easy as changing to a simple WordPress theme or creating site with default editor and you need to invest effort and time to understand the page building with visual composer, essential grid and other slider plugins. It is up to you to evaluate spending money and investing time on this theme to transfer your existing site but this will be a good bet for new sites. Assuming you have good server resources and content, highend is the final theme you will buy as they show on their demo. There are as many as default features and options to customize your site. The advantage is the integrated online shop and membership features. Also there will be no need of additional shortcode plugins with the built-in shortcode generator. Integrated Woocommerce support for creating online shop. Theme is fully responsive and optimized for Retina display. Theme supports different types of page layouts like scrolling presentation, seven default post formats like quote, video, audio, etc. and custom post types. Builtin templates for pricing tables, FAQ, portfolio, gallery, testimonials, team members and clients allows you to create literally anything you want without the need of additional plugins. Different types of header, footer and blog layouts make things more easy to build a wonderful site. Drag and drop visual composer, slider revolution and essential grid plugins transform your site to next level. Custom Google fonts, 50+ shortcodes, 20+ sidebar widgets, unlimited sidebars. mega menu, WPML and RTL supported. The list will go long if we describe each feature, it is worth to look at their main demo site to see the features in action. Besides the main demo there are also demos available for restaurants, corporates, simple blogs, photography, etc. Is it Suitable for Your Site? This was the question in our mind for many months even after we bought the theme. Because after installing the plugins and demo data the site we installed really looks heavyweight whereas it was a simple lightweight site with the previous theme. When we just checked the source code it was having >2.4k lines on the new site with highend theme which was more than three times compared with the same site using other theme. Basically we do not like so many codes on the source and we found each additional plugin is causing more load on the server by creating so many shortcodes. We also know the huge dependencies on auto generated shortcodes will make the theme switch very difficult once you want to move out of highend theme. We have tested with page speed tester tools with shared hosting to find the rank as low as 30-40 on both mobile and desktops with the demo content. The same site previously was previously ranked between 70-80 range on mobile and desktop. Since we love the features of the theme and have long term commitment, we went ahead with migrating to highend. As expected, the look of the site was completely changed with more professional layouts and integrated shop getting lots of positive user responses. We also moved from shared hosting to managed WordPress hosting and using premium caching and CDN to distribute the content fast. Cost effective combined with top-rated premium plugins like Visual Composer, Slider Revolution, Essential Grid, etc. Highly customizable with one click demo data and child theme. Lifetime support and auto update from the developer. Compatible with bbPress, Woocommerce and integrated login module. Large variety of built-in templates to choose from. Theme without bundled plugins is less attractive. Migrating an existing site is not an easy task with different types of plugins needs different type of image sizes. You may need appropriate server resources to run a large site with highend theme. High use of shortcodes will make the theme switch a difficult task later. So can I buy this theme or not? – The answer depends on the features you want to use. If you are looking for creating a site as shown in the demo then it is highly recommended to have an appropriate hosting server to accommodate all those heavyweight plugins in addition to other plugins. If you run a simple blog then highend will be like fitting a huge wedge into a small hole. More suitable – One pager sites, personal sites having limited pages, companies who hire people to maintain their sites, sites having solid hosting platform. Not suitable – individual site owners having sites on shared hosting servers. I am also relatively new to WordPress and have reviewed and used the tutorials on the Highend theme with limited success. My biggest issues is not necessarily how complex this theme is, but the lack of adequate documentation for such a complex theme. The high speed tutorials or not the right way to teach people how to use this theme. Are there any updated tutorials on this theme that do a better job? Maybe something that talks? you can check their video tutorials page – https://hb-themes.com/documentation/highend/#video-tutorials. There is a learning curve, but I would not change this theme for any other. I agree!! The sales techniques at the Mojo Marketplace entice you to purchase the entire package for $300 because you get Tech Support for 30 days. Hummm…. not really. You get a half hour twice a week for an appoitment or you can try and try and try to call as a “walk in.” I’m sorry, but I feel taken advantage of as someone who is not a coder and could never get really help. So, my “investment” sits as I try to find a web designer or move on. This is definitely a decent review explaining pros and cons. The only concern in using Highend theme is the changeability. Due to shortcodes and Visual Composer, it makes difficult to switch the theme. But yes, the same situation for similar themes. If you haven’t seen yet, they now offer live chat support. I got several answers from Branko within minutes. This is the case with most of the popular themes bundled with plugins. Visual Composer always have problem in working with front-end editor, that is not related to the theme (now VC doesn’t even offer templates when bundled with themes). All other options like fonts, logo and colors should be customized under theme options. Believe us, 40 hours is really not sufficient to make the site looking like demo which is true for any commercial themes at this grade. For example, when you buy themes from Themeforest, no single image shown in the demo can be imported through demo content and you need to start with a skeleton. You have done it correctly to hire someone when you don’t have time. In our opinion – It’s not misleading but a fact difficult for end users to accept. Theme sales and demo setup are two different things sold separately in any marketplace. This can be clearly seen in Mojo marketplace when you purchase the theme. I bought this product because it said it was user-friendly, 1 click demonstration, drag and drop etc. Upon calling your tech line I was informed none of that is true unless you pay an install fee of $149. This is a completely fraudulent explanation of services and of the product. Then they refused to give my money back. The demo is very pretty to look at but if you are not experienced at web design this is a complete ripoff. Other sites like wix.com are so much easier and faster to use. DO NOT waste your time and money being frustrated with this product when there are so much better sites out there. The conclusion in the above review is pretty clear that you may need to hire the developers for more customizations. But importing demo and building with Visual Composer should not be a problem. The issue is your expectation of comparing Wix with a WordPress theme. You need to understand the difference between Wix, Weebly or any other free hosting services and self-hosted WordPress site. WordPress has very long learning curve (regardless of the theme) but it is worth to patiently learn in order to have a freedom of having a proper site. Otherwise you can always go with free site builders without even having facility to backup your own content. This point of view is no way related to a theme. Highend was one of my first creations with WordPress. It looked like the best theme Mojo had to offer. The developer had 22 sales at that time and support was direct from him and he pulled me out of several jams since I was new to WP. I wrote a long 5 star review of which no one does on Mojo. A couple months later he had close to 2,000 sales. Once his numbers grew, he started hiring support help and as Anna stated the new support staff auto directed you to tutorials and on a few occasions did not even read the ticket correctly. Since I had developed a relationship with the developer, I was free to email him directly for support and he always takes care of the problem. In my opinion his theme still tops most I have used and I have around 6 licenses with highend. Being new to WordPress I preferred video tutorials that talked you through the instruction and not a high speed visual. There are some sleeper themes on Mojo from themeofwp such as Cosmos that does not get much attention and the support is excellent. As far as speed from highend, I have good speed on each site I have used and the mobile menu is excellent. In close, I would recommend highend from my experience with other theme developers. The present support situation does need a fix, but bugging them will get results. This is a standard problem with all startups. Once the company grows the knowledge of the support staffs is not same as the original developers. Now that they have even raised the price from $49 to $59 with lower level of support. But the point is, it is unavoidable and the same case with many other popular WordPress themes / plugins. Overall it is good theme – achieving 17K sales on mojo marketplace is an indicating of that. I started using this theme almost a year ago and have had AWESOME support for ANY issue that I have had( which mostly had to do with me adding additional plugins that interfered with the ones in the theme). A year into the theme I have looked to see if there are other themes out there that can replace what this one does(recently exploring the well known Genesis “Foodie” theme)…..and it cannot touch the “HIghend” themes ability. I am not a web developer, and have only been building websites and working with the web 1 year, and These people have been awesome!! You just simply have to open up a ticket and explore keywords by yourself to find answers……I have almost always found my answers SUPER Quick by reading the threads. THIS THEME ROCKS!! Your site looks good without any white space as you mentioned. Probably you need to clear the browser cache and check. Visual Composer code from this test page to a new site using the same theme? I don’t want to rebuild the sequencing over again. Thank you again for your input. Yes, you can copy the code from text editor and use on other site by replacing the links/images. Furthermore, all of the “free” add ons are extremely limited in nature and most require you to purchase and upgrade to get full utilization and or support. If you look at their help forum there are well over 12,000 help requests, the vast majority of those requests are the same ones over and over. The company should recognize this and set up better help and tutorials. I would not suggest anyone who is not familiar with setting up a new WP site from scratch to purchase this theme. Definitely it is not for beginners who want to customise things on their own. Either you can hire them to make your site as shown in demo or you need to play around to customize. Also most of the themes offering bundled plugins have the same issue that they don’t allow direct access to the plugin developers. 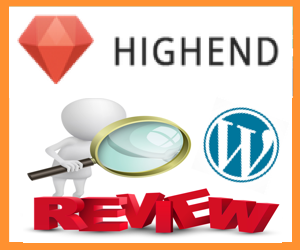 Overall Highend is a good theme with decent support if you have the need of running a complex WordPress site. It is also the top selling theme on Mojo Marketplace. Yes and sometimes they do not even read the support request correctly. In the early stages, Branko fixed the issues and did not direct you to a documentation.